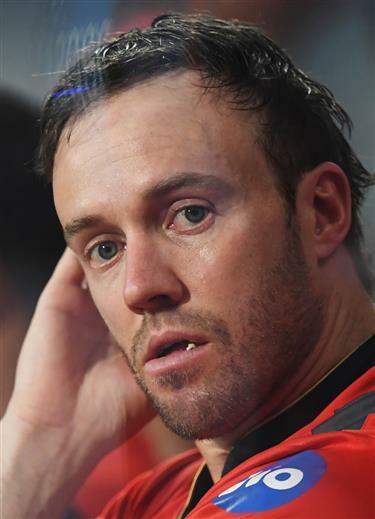 South African talisman AB de Villiers announced his retirement from all forms of international cricket yesterday, saying he was tired and wanted to step out while still at the top. “After 114 test matches, 228 one-day internationals and 78 T20 internationals it is time for others to take over. I’ve had my turn and to be honest I’m tired,” he said in a video message on Twitter and in a statement. The 34-year-old, whose swashbuckling batting style and razor-sharp fielding has made him one of the sport’s leading lights, only returned to tests in December after a lengthy hiatus where he focused on the limited overs formats of the game. De Villiers, who played for the Royal Challengers Bangalore in the Twenty20 Indian Premier League, retires with a test average of 50.66 and as the fourth-highest scorer for South Africa with 8,765 runs. He made 22 test centuries and also took 222 catches and had five stumpings, having spent part of his career in the role of wicketkeeper. “AB is one of the all-time greats of South African cricket who has thrilled spectators around the world with his sheer brilliance, coupled to his ability to innovate and take modern day batting in all three formats but particularly in the white ball ones to new levels,” said Cricket South Africa president Chris Nenzani.